U.S. Navy Reports Rescuing 13 Iranians From Somali Pirates : The Two-Way A team from the aircraft carrier strike force group that Iran threatened earlier this week went to the aid of Iranians who had been held captive for several weeks, the U.S. Navy reports. Thursday: The guided-missile destroyer USS Kidd responds to a distress call from the master of the Iranian-flagged fishing dhow Al Molai. A team from the aircraft carrier strike force group that Iran threatened earlier this week has rescued 13 Iranian sailors who were being held by Somali pirates for several weeks, the U.S. Navy reports. 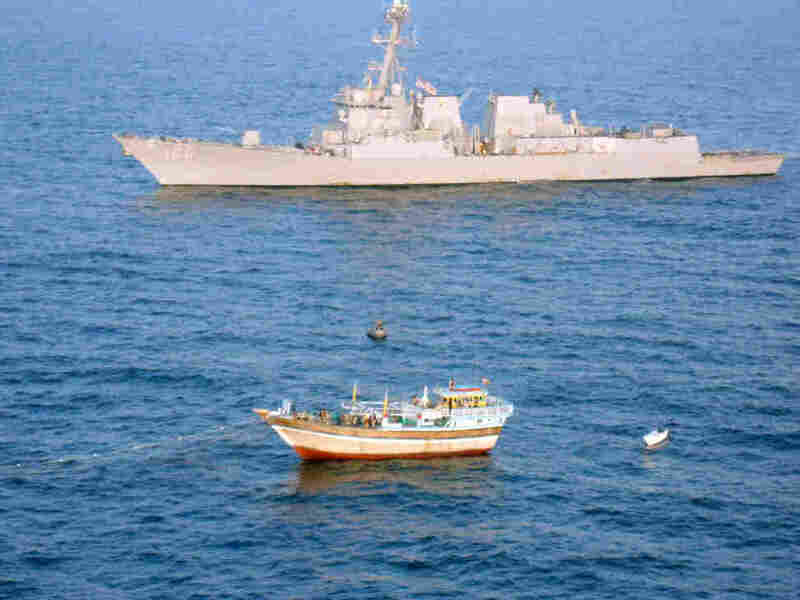 "At approximately 12:30 p.m local time [on Thursday in the northern Arabian Sea], an SH-60S Seahawk from guided-missile destroyer USS Kidd (DDG 100) detected a suspected pirate skiff alongside the Iranian-flagged fishing dhow Al Molai. Simultaneously, a distress call was received from the master of the Al Molai claiming he was being held captive by pirates. "A visit, board, search and seizure team from Kidd boarded the Al Molai and detained 15 suspected pirates who had been holding a 13-member Iranian crew hostage for several weeks. The Al Molai had been pirated and used as a 'mother ship' for pirate operations throughout the Persian Gulf, according to members of the Iranian vessel's crew. "The pirates did not resist the boarding and surrendered quickly." Navy personnel took the pirates into custody, returned the dhow to the Iranian sailors' control and provided the crew with "food, water and medical care," according to "Josh Schminky, a Navy Criminal Investigative Service agent aboard the Kidd," the Navy statement adds. As we reported Tuesday, Iran has responded to the tightening sanctions on it from the U.S. and other nations by threatening to shut the Strait of Hormuz. The Stennis cruised through that area earlier this week, prompting Iranian Maj. Gen. Ataollah Salehi to say his nation "advises, recommends and warns them [the US] not to move its carrier back to the previous area in the Gulf because Iran is not used to repeating its warnings and warns just once." The Obama administration "brushed aside" that warning, as The Associated Press says. The Navy has posted a very short video clip taken during Thursday's rescue.